Winter is just round the corner and this might be the perfect time to invest in a chicken coop heater. Right now, we are all looking forward to spending the next few months with the heat cranked up and swaddled in blankets. After all, who does not love the holiday season and white Christmas spent around the warmth of the drawing room fire. But if you live in a farm and rear farm animals you might be in a bind with regards to whether you should get heaters for your beloved animals. There has always been dissident voices about the need for extra warmth for chicken during the winter. But the actual answer may vary depending upon the geographical location of each farm and the corresponding severity of the cold experienced there. 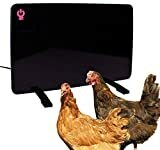 If you feel that it is too cold in your area and your chicken do need the extra warmth to be comfortable in the winter months, then you should go for a heater. These innovations in heating for farm animals is safe and convenient. Not only are most of these appliances energy efficient, they are also unlikely to cause any fires in coops that are surrounded by highly flammable substances such as straw, feathers, etc. If this is your first time investing in a sweeter heater for your farm buddies you might be slightly baffled by the sheer number of varieties available. While the tech specifications and lingo may seem confusing, we are here to break them down for you. So without further ado lets us get to looking the best coop heaters that you should consider. Brinsea EcoGlow is a broader with a radiant underside that warms newly hatched chicks and ducklings. These newborn fowls may not yet be capable of mustering up enough body heat to survive harsh winters. They can get all the help they need from this appliance. The Brinsea brooder produces a uniform heated temperature throughout its body. As implied by its name, this offering from Brinsea is even energy efficient and consumes minimal power. Unlike regular heat lamps that consume about 250 watts, the Brinsea only needs around 14 watts to run at full power. This goes a long way in preventing energy wastage and even helps you save money. It comes in three adjustable height variations in order to accommodate different chick heights underneath it. The indicator light that blinks up when the appliance is switched on ensures that you are unlikely to mistakenly leave it off and consequently cause any unintentional harm to your chicks. The Brinsea EcoGlow also comes with an extended cord that gives it a longer reach and lends you greater maneuver ability in terms of positioning the heater. This dimensions are measured at 12x8x8 inches allowing it to accommodate up to 20 chickens at a time. Some of its best features as well as it’s disadvantages are listed in the following section. This chicken coop warmer from Cozy Products is the perfect winter accessory for your farm animals. This appliance too is extremely energy efficient and consumes only about 200 Watts of electricity unlike most regular space heaters that can use up to 2500 watts. It combines radiant as well as convection heating to produce the best warming effect for your chicks. The radiant heating technology that Cozy products uses ensures that it transfers heat from one body to another as long as they are in close proximity of the heater. It does not warm the entire room but any chicken that needs the warmth can just position itself close to the heater panel. It comes in a single size and can be fitted against the bottom of the wall anywhere in the room for your animals to bask in its heat. This appliance also comes with a clearly visible on and off button for easy and convenient handling. Furthermore, with its matte black finish, the design of the heating pad is also sleek and stylish. So let us take a look at both its pros and cons to better help you figure if this is the right cozy coop heater for you. This thermostatically controlled heated perch from K&H Pet Products is perfect for warming upcold or frozen chicken feet. After this heated perch gets the toes and the feet of chicks all warm and cozy, it takes little time for the rest of the body to follow suit. The warming effect is created on perched chicks by having their own circulatory system spread the heat from the feet to the rest of their bodies. 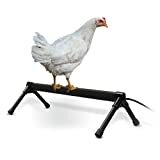 This appliance is available in different sizes and you can opt for either depending upon how many chicks you need this perch for. These sizes include a small 26 inch long perch and a larger 36 inch long perch. It has undergone rigorous testing in MET laboratories across the US in order to ensure compliance with safety standards. This heater pad is another quality offering from K&H Pet Products. It is extremely energy efficient with a low consumption of about 40 watts. This ensures that the product is both environment friendly as well as cheap on your pockets. Unlike regular heating lamps which consume anywhere between 400-2000 watts, this heating pad is unlikely to rack up high electricity bills. This heating pad can be installed both indoors and outdoors in a vehicle or horizontal position allowing a lot of flexibility in usage. The design is sleet and the material is resistant to being pecked and chewed through. The heating mechanism is controlled by an internal thermostat which works perfectly fine in sub zero temperatures. 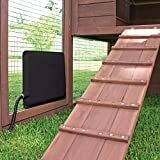 This chicken coop heater flat panel uses infrared heating to warm up your pets. It is capable of transmitting heat in a area as large as 330 square feet. This appliance poses no fire or other safety hazards and is a completely safe option for you chicken coop. Compared to regular fire or lamp heatersit is also energy efficient, consuming only about 100 watts of energy. The makers also guarantee that this heater generates a uniform heating effect and no concentrated and overheated spots. It also comes with a mounting system for overhead suspension complete with attached hooks and chains. This combined with the three year warranty the makers offers ensures that the product is an excellent investment for the winters. Thus, it is evident from this article that there are a great many options available to you when it comes to chicken coop heaters for the coming winter. Each of the five listed products offer varying advantages that may suit the particular needs of different people. So it is imperative that you do a thorough research before settling on the one to buy. We wish you happy holidays and hope that our review has been helpful to you.